We use and develop modern theoretical tools to describe functional materials at the microscopic level. Our goal is to understand and predict electronic, optical, and dynamical properties of complex systems, such as hybrid molecule-metal interfaces or lead-halide perovskites. To this end we combine quantum-mechanical approaches, molecular dynamics, and state-of-the-art computational techniques, see research section. 03.02.2019: Christian’s paper on disorder and Urbach energies in perovskites was posted on arXiv. 01.02.2019: We are happy to be part of a new priority program that will fund perovskite research in Germany. 28.01.2019: Hubert’s benchmark study on structure and binding in halide perovskites has been deposited on arXiv. 01.12.2018: We are very happy to welcome our new group member Lisi Wruß, who will be working as a postdoctoral fellow with us. 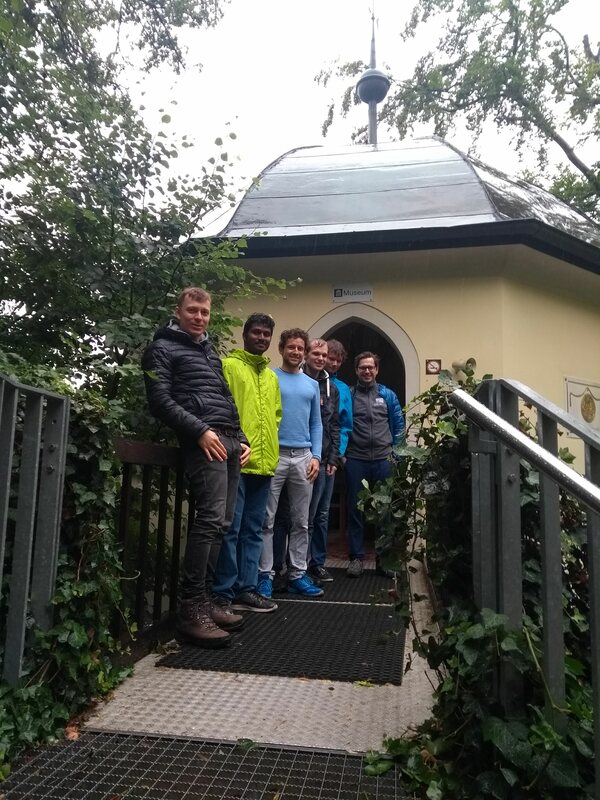 17.10.2018: To say Goodbye to Arun, and to welcome Berni and Daniel, our group recently went on a hike in the lovely Laber valley close to Regensburg. 10.10.2018: A paper with our collaborators from the Weizmann Institute and the University of Pennsylvania on defects in halide perovskites has been deposited on arXiv. 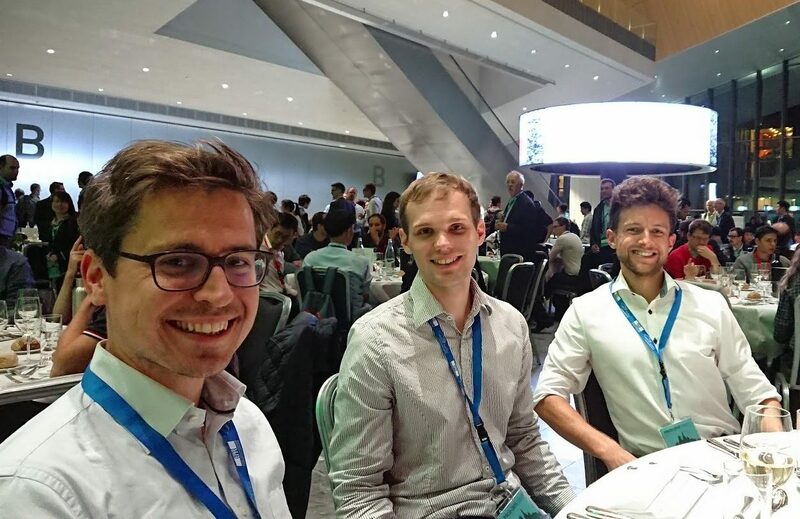 02.10.2018: Max, Christian and David attended the PSCO meeting in Lausanne – we had fun! 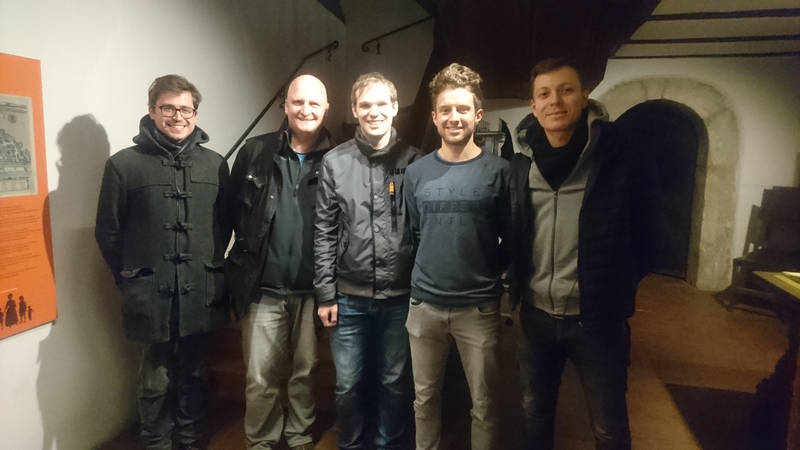 01.10.2018: A warm welcome to the new members of our group, Daniel Angerer and Bernhard Kretz. 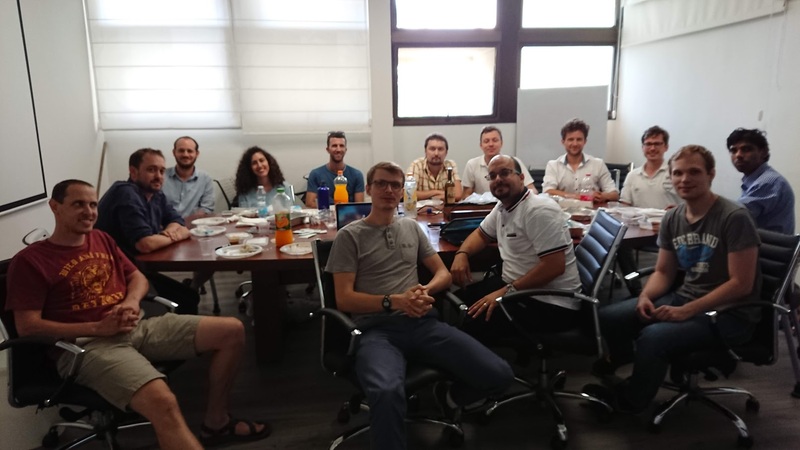 27.08.2018: Part of our group visited the lab of Omer Yaffe at the Weizmann Institute of Science. 16.07.2018: We are very happy to welcome Arun Sagotra from UNSW Sydney, who is visiting us for the next three months. 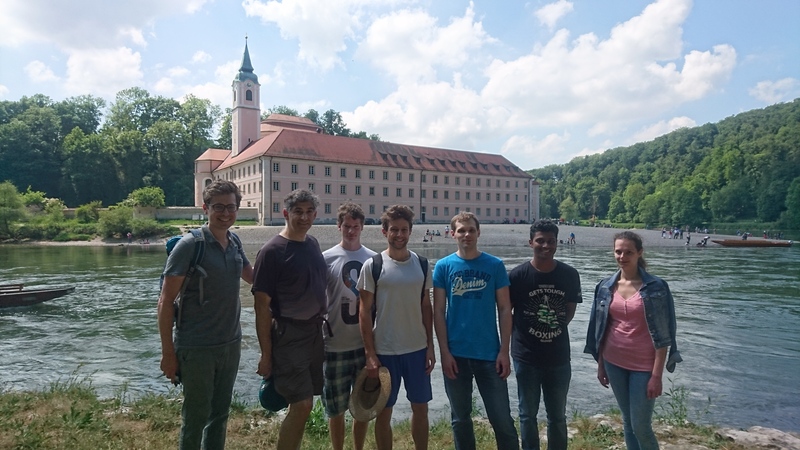 29.06.2018: The CMS group visited the impressive Schulerloch cave near Kelheim. 24.05.2018: A paper by David on antimony halide perovskites has been deposited on arXiv. 22.05.2018: We received startup funding within the UR Fellows Program for launching an interdisciplinary initiative with colleagues in experimental physics and chemistry! 14.05.2018: Our group had some exciting days discussing science and hiking along the Danube with our visitor Prof. Andrew Rappe from the University of Pennsylvania. 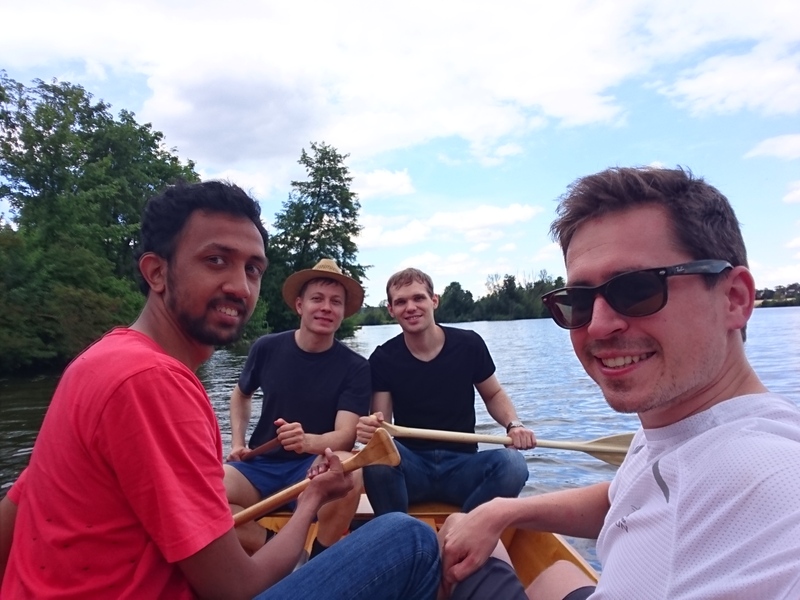 09.05.2018: Welcome to Harikrishnan K.P from IIT Bombay who is visiting us this summer! 30.04.2018: We are grateful to receive computing time for JUWELS, Jülich supercomputing center. 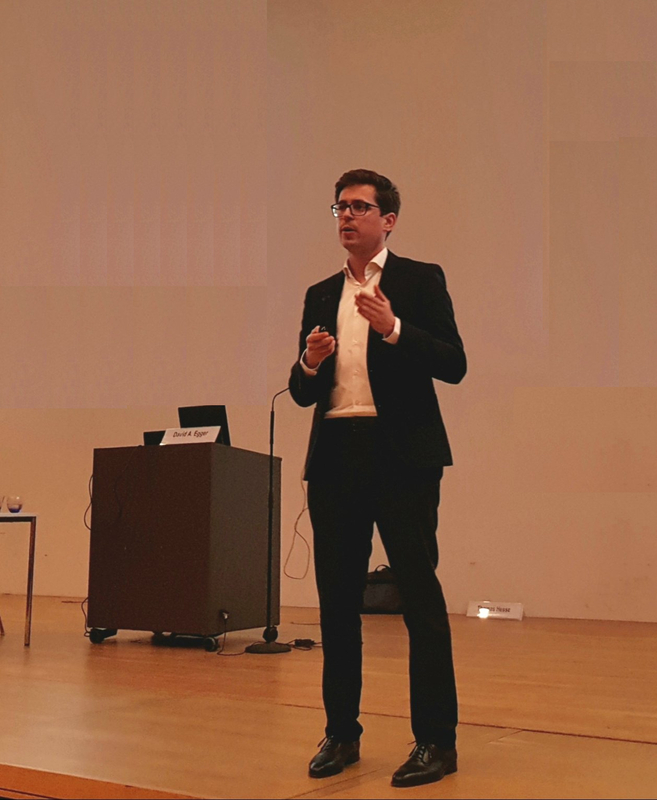 25.04.2018: David delivers the keynote lecture at the network meeting of the Alexander von Humboldt Foundation in Regensburg. 22.03.2018: What remains unexplained about the properties of halide perovskites? Click here to find out. 12.03.2018: Hubert Beck has joined the group for his M.Sc. thesis, welcome Hubert! 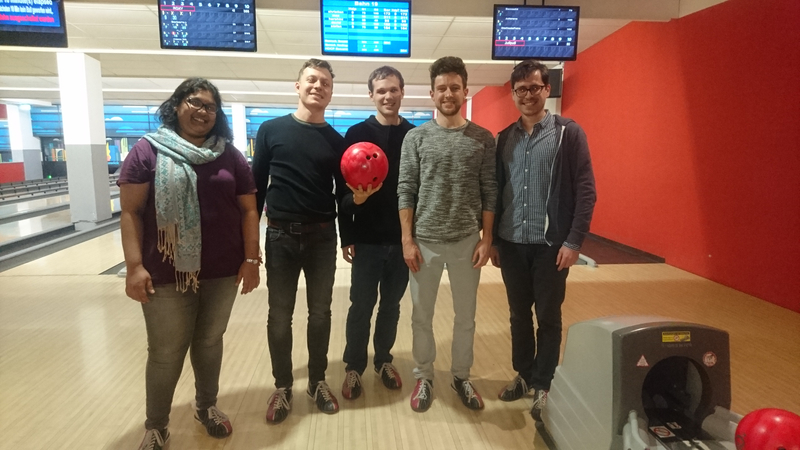 08.02.2018: Our group celebrated its one year anniversary with a dinner and playing some bowling. 05.02.2018: We are happy to welcome Harshini Venkata Annadata from the National University of Singapore as a visiting student. 10.01.2018: Check out our recent collaborative papers, posted on arXiv, on phonons in hybrid perovskites and their relation to carrier lifetimes and ionic composition. 06.12.2017: Our group had fun at a Christmas outing & visited the excellent Kepler museum. 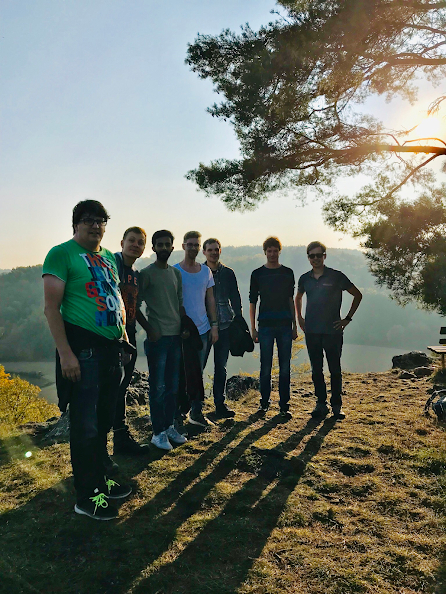 11.10.2017: We are very happy to welcome two new group members: Max Schilcher joins as a PhD student, and Robert Hrdina supports our office duties. 04.07.2017: We visited the lovely Regensburg surroundings for some climbing and paddling action. 08.06.2017: Our group is co-organizing a minisymposium on theoretical chemistry in Regensburg. 26.05.2017: We are proud to be part of SFB 1277, granted by the German Science Foundation. 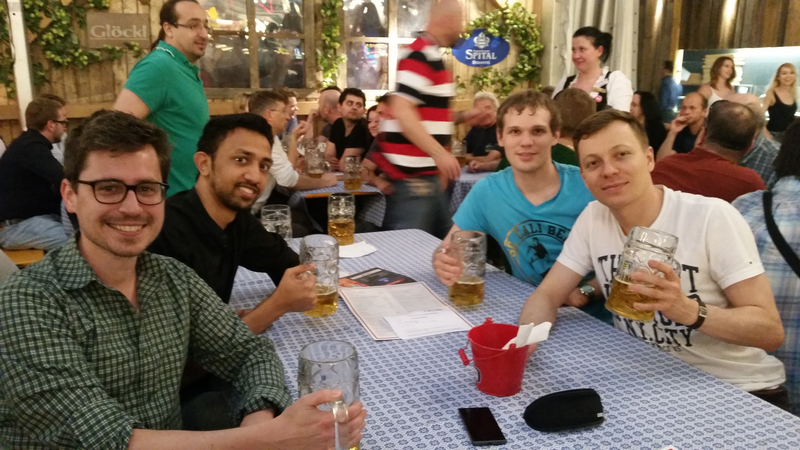 19.05.2017: Our group celebrated its start at the Regensburg Dult, click here for a group picture! 04.05.2017: We are very happy to welcome Keshav Srinivasan from IIT Bombay as a visiting student! 27.04.2017: We are grateful to receive computing time for JURECA, Jülich supercomputing center. 03.04.2017: Christian Gehrmann has joined us as a PhD student, welcome to the group Christian! 04.03.2017: Stefan Seidl has joined the group as a PhD student, welcome Stefan! 01.02.2017: the CMS group starts in Regensburg, exciting times!